Like many, I spent large chunks of my allowance and lawn mowing money on 1991 Score Baseball in the months after it came out. The massive checklist was part of it. There was also the chase for an iconic Jose Canseco card that was the subject of much recess discussion and debate. Today, 1991 Score Baseball doesn’t get a lot of love. It should. 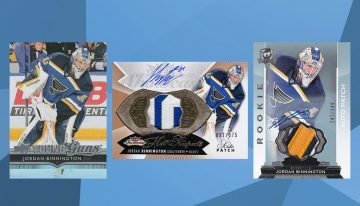 It’s one of those sets that everyone who collected in the era knows about, yet it doesn’t generate a lot of that nostalgic glory some other sets from the same period do. 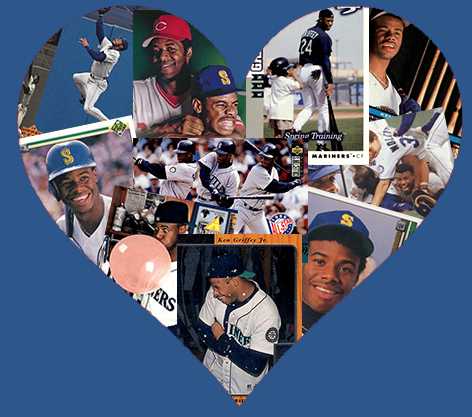 It has no Ken Griffey Jr. Rookie Card leading things off or foul language scribbled on the bottoms of bats. A big part of that is that we’re still swimming in stashes, stacks and garage finds of boxes, packs, opened leftovers and factory sets. 1991 Score Baseball is the opposite of rare. But just because something is easy to find shouldn’t take away from its greatness. In no particular order, here are 16 reasons why you should take some time with 1991 Score Baseball, either in the form of a retro revisit or a first-time experience. 1991 Score Baseball has a lot to take in. 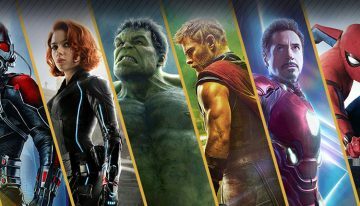 While set size plays into it, that’s only part of the story. In 1991, there was no Baseball Reference. We got our main baseball info from TV highlights, newspaper box scores and, if we were lucky, a subscription to a subscription to Baseball Weekly. All of those are fairly fluid and don’t play into the on-demand way society is today. That’s part of what made sports cards so useful — especially ones like Score that took great pride in informational card backs. For 1991 Score Baseball, there’s lots of it. 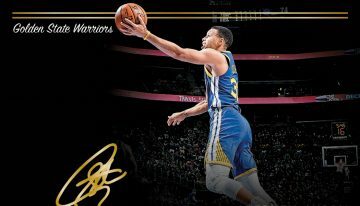 Card backs have full career stats. And when those numbers don’t fill the space, added written bios do. The tightly blocked design of these makes them easy to read if you can get past the font size. 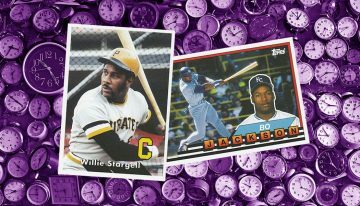 Full color is also used, which helps differentiate them from similarly loaded Topps backs. It’s actually quite impressive how much they squeeze in, especially when the player portrait is taken into account. 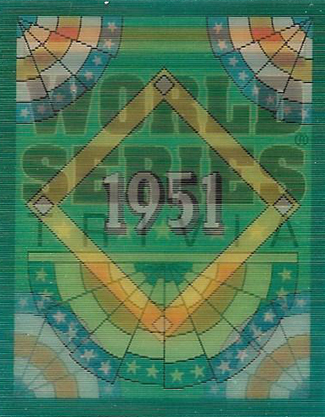 Beyond the card backs, 1991 Score also has those lenticular World Series trivia cards that were in every back. These made for great reading and baseball history lessons as well. 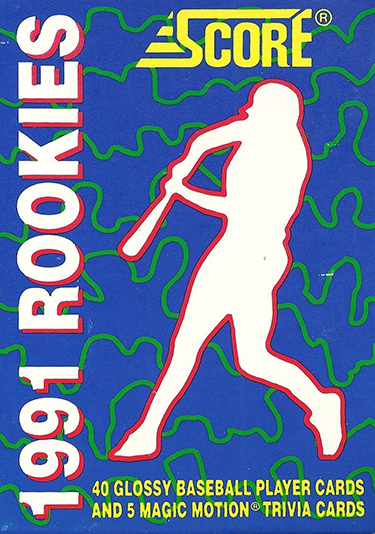 Although the main player cards in 1991 Score Baseball are fairly bland. But the party gets going in some of the subsets. 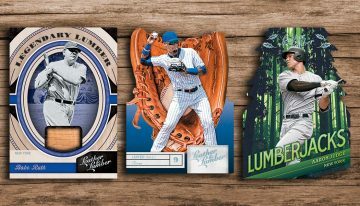 Master Blaster, Rifleman and K-Man all take similar approaches to the different ways power comes into play for baseball. Whether it’s at the plate, in the field or on the mound, power is one of the fastest ways to drama and excitement in the sport. As for these cards, the backgrounds are where it’s at. They have an manga feel to them where the background is demonstrating speed. Not to mention, the gimmick look is pretty mesmerizing. 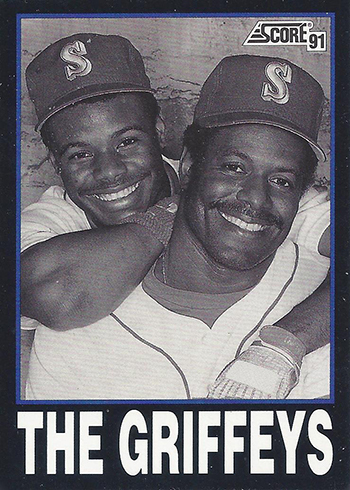 For a game that is often celebrated as being shared by fathers and sons, it all came full circle in 1990 when Ken Griffey Jr. and Sr. suited up together for the Seattle Mariners. Several cards have been made commemorating the moment, but this is one of the best. 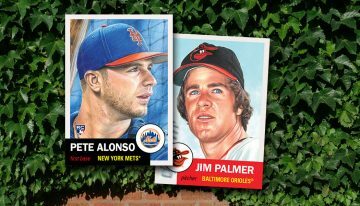 The black and white portrait, matching smiles and familial chemistry make for a memorable card of a timeless MLB moment. 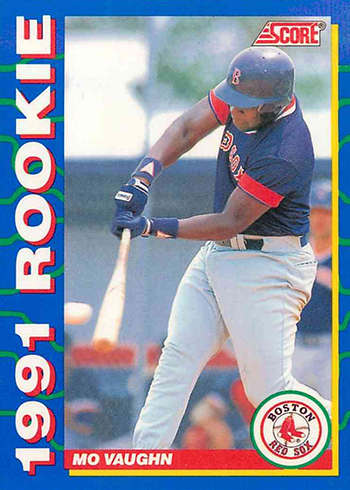 1991 Studio might get most of the recognition as far as portraits on baseball cards (that was the focus of the entire set, afterall), but 1991 Score works the style in in a few places. The Franchise one such spot, highlighting a team’s best player. Yes, it can be debated in some instances as far as selection goes. But one thing that can’t be argued is how classy the cards turned out. 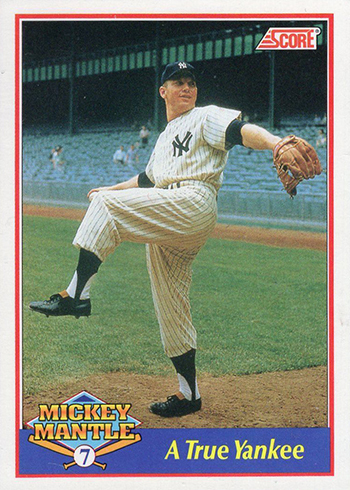 The 1991 Score Mickey Mantle inserts follow in the footsteps of Upper Deck’s initial success doing similar Baseball Heroes inserts for Reggie Jackson and Nolan Ryan. 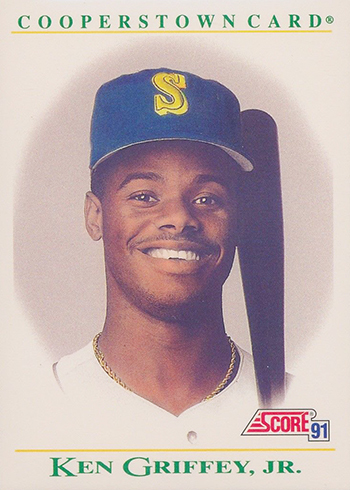 But while the Upper Deck inserts were easy to find, the 1991 Score Mantles aren’t. 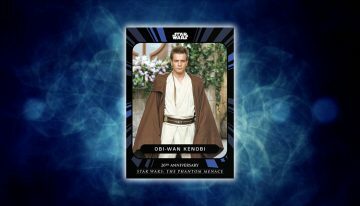 Found in Series 2 packs on, wrappers state that less than 36,000 total made their way into packs. Spread across seven different cards, that’s just over 5,000 copies per card. 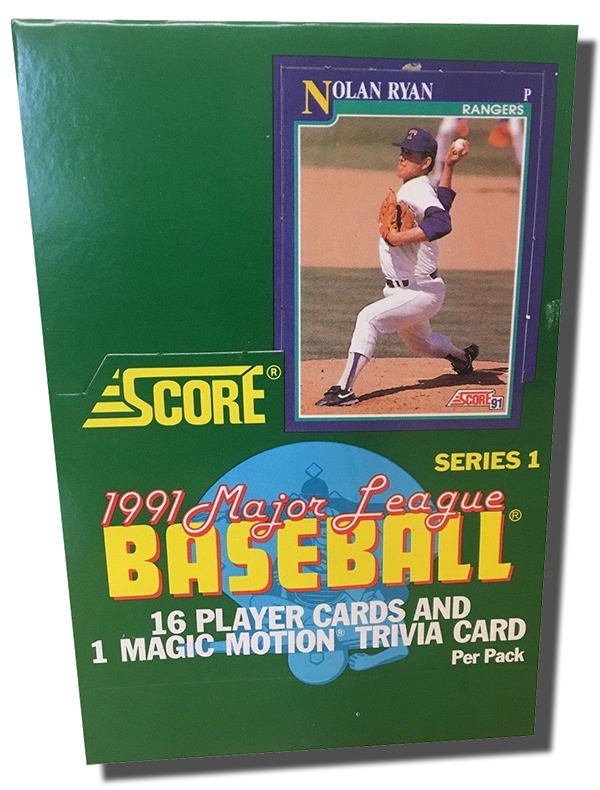 Factor in just how much 1991 Score Baseball was made and you start to see that these are tough. 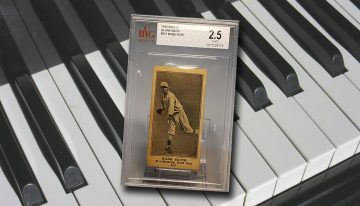 On top of the seven regular inserts is an autograph numbered to 2,500. 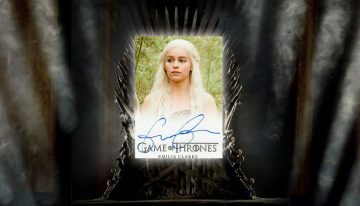 A separate pack of all seven cards, numbered to 5,000, were also distributed. Like Upper Deck’s Baseball Heroes, 1991 Score Mantle cards chart the legend’s career. 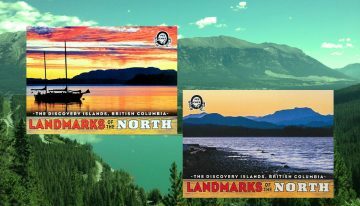 The photos and layout are simple but do a great job at tapping the old-time feel. 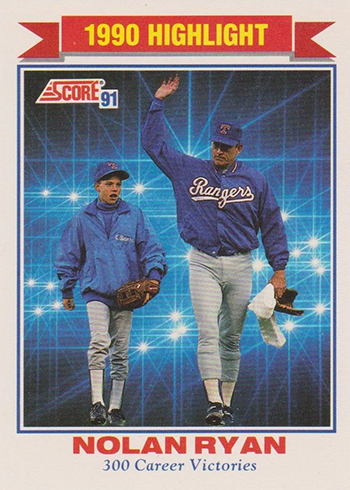 Between his sixth no-hitter and his 300th win, 1990 was a good year for Nolan Ryan. Not surprisingly, a lot of cards followed in 1991. This one might be the best, at least when it comes to pulling at the heartstrings. It comes after the game, a Rangers victory over the Milwaukee Brewers. It was one in which Ryan threw 146 pitches. Pitch counts apparently meant less back then, especially to a 43-year-old looking for one of the game’s biggest milestones. For a man who is often portrayed as tough and stoic, there’s clearly some emotion and gratitude in his face and body language. And then there’s his son Reese at his sharing in the moment. And credit where credit’s due — the flash background that Score’s design team came up with is the perfect backdrop for such a big moment. It was hard not to open tons of 1991 Score Baseball back in the day. The massive set size demanded it. But when the 101-card blister packs came along, it was like collecting on steroids. Those stacks grew fast. By the time I found these packs, I’d largely moved on. 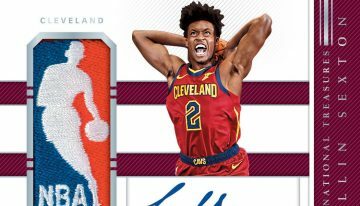 But there was one card inside I wanted — the exclusive Hot Rookies insert. 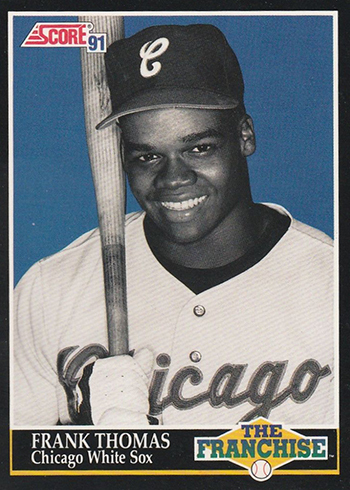 Even then, I really only wanted the Frank Thomas. 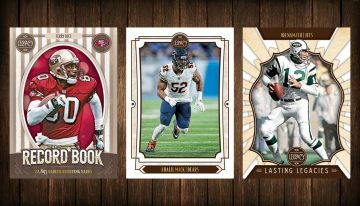 But when you’re going after one card that’s one per pack, it quickly becomes a set build when you don’t get it in the first couple of tries. Eventually I found the Thomas but only after missing several times over. If you were a sports fan in the late ’80s and early ’90s, there’s a good chance you showed your sporting allegiances not just through a cap but a t-shirt. But not just any shirt with a team logo spread across it. 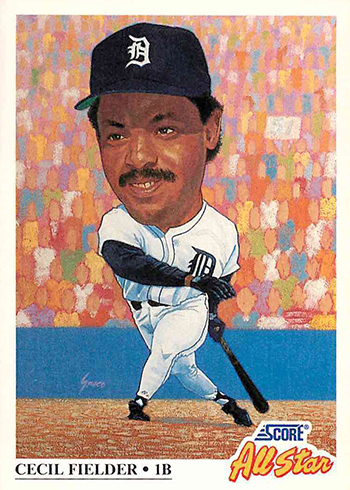 This was the caricature era where athletes were drawn as cartoons with big heads — essentially like a two-dimensional bobblehead. 1991 Score All-Stars took on this style for one of the most fun subsets in the product. The artist is Chris Greco. 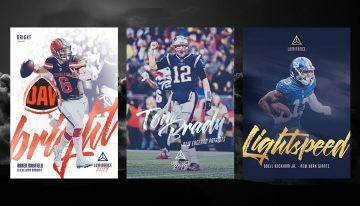 His portfolio is a big one, including work on multiple Disney features. 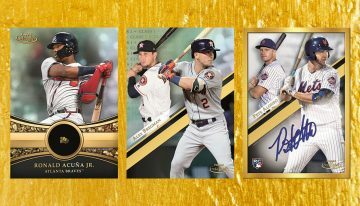 American League players are in Series 1 while the NL is represented on the Series 2 checklist. 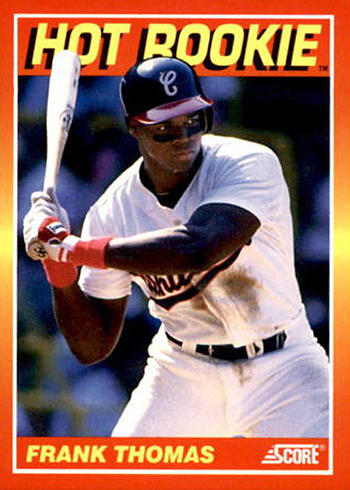 Bo Jackson had a lot of defining moments in his career. Whether it was winning the Heisman, running up walls, mashing monster home runs or making ‘Bo Knows’ a legitimate catch phrase, anything he did seemed to make a highlight. 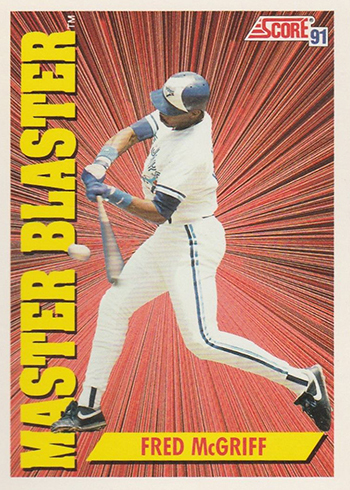 Outside of the black and white photo of him holding the bat while wearing shoulder pads (found in 1990 Score Baseball), few Bo Jackson images are more ingrained than Bo snapping bat over his knee. 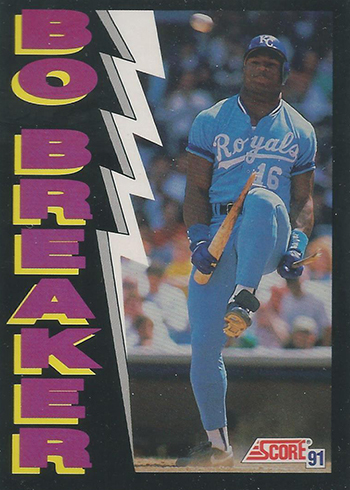 The 1991 Score Bo Jackson “Bo Breaker” #773 captures that spurt of anger and completes it with a very ’90s design. 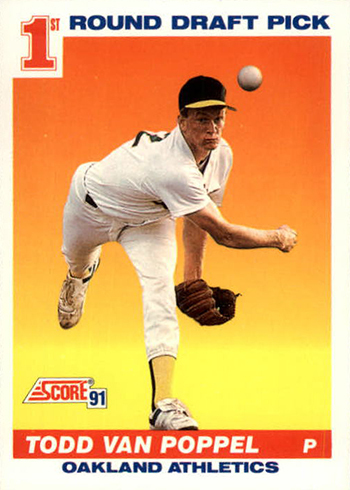 1990 was a record year for no-hitters. In total, there were nine different games, including a couple that ended after eight innings pitched so their place in history doesn’t stand in some books today. Among them? 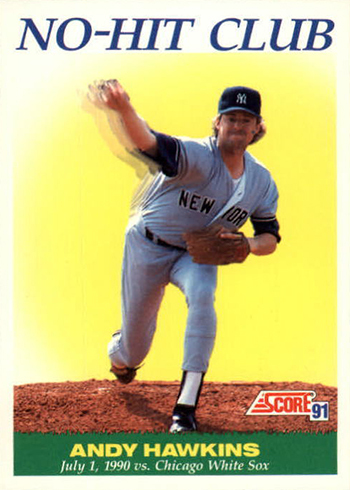 Andy Hawkins going eight hitless innings and the Yankees still lost 4-0. 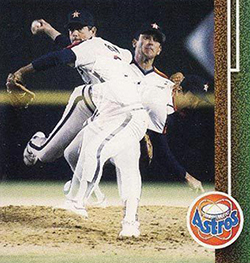 There was also Nolan Ryan tossing his sixth at age 43 (he throw his seventh a year later). 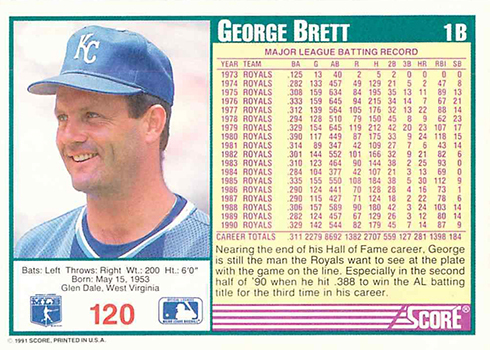 With no-hitters so plentiful, 1991 Score included an entire subset dedicated to them. 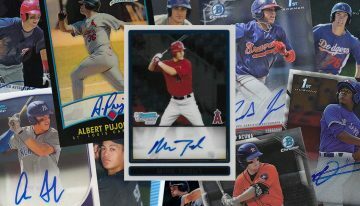 It’s not exactly Topps Now in its immediacy, but the cards do chart a defining part of the season that was. 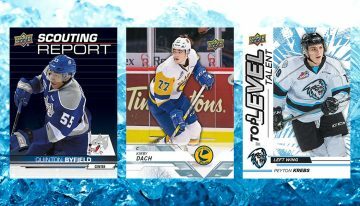 The cards can be found in Series 2, running #699 to 707 on the checklist. 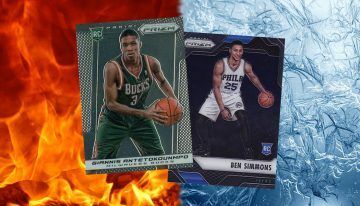 Who complains about Rookie Cards. Draft Picks subsets were a thing back in 1991. 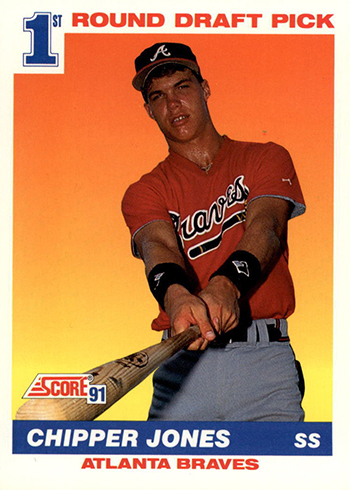 And if you’re a fan of orange gradient backgrounds, 1991 Score Baseball was the set to get. Todd Van Poppel may not have panned out as most expected but that Chipper Jones sure did. Mike Mussina wasn’t too bad either. None of these RCs carry much value today. Even a raw Jones isn’t much more than a pack of Hubba Bubba. The Oakland Athletics were a powerhouse in the late ’80s and early ’90s. And it wasn’t just the Bash Brothers and the rest of the offense. Their pitching was great, too. While Dennis Eckersley and Dave Stewart may have put together bigger careers, Bob Welch’s 1990 season was one for the ages, racking up 27 wins. 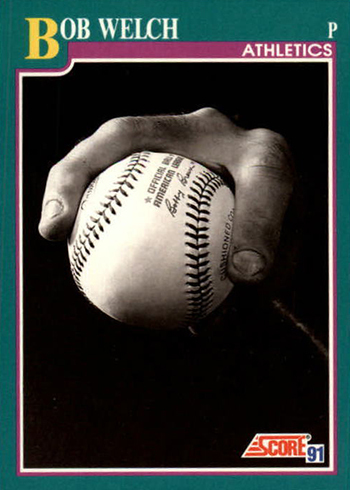 This “Success Is a Split-Finger” card (#568 on the checklist) is a gimmick card. It doesn’t really fit anywhere else on the checklist. But with that awesome photo, it doesn’t matter. 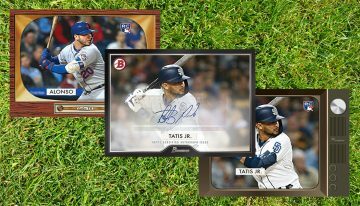 For a set that is full of bright colors (and lots of them) and whiz bang baseball card theatrics, there’s something classy about the factory set-exclusive Cooperstown Cards. 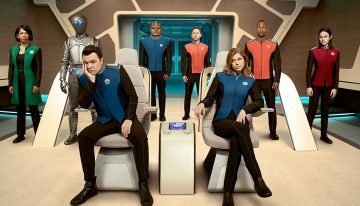 They bring a lot of white space, which draws you right in to the head portrait. At least for six of the seven cards. 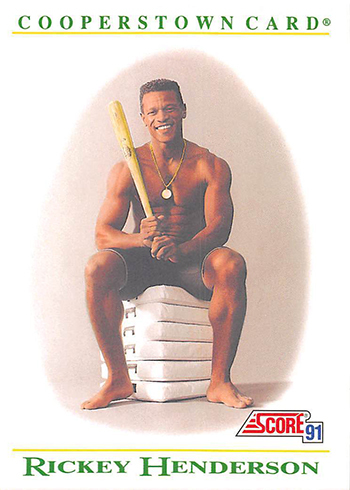 Rickey Henderson gets to sit of a throne of bases wearing nothing but a pair of shorts. 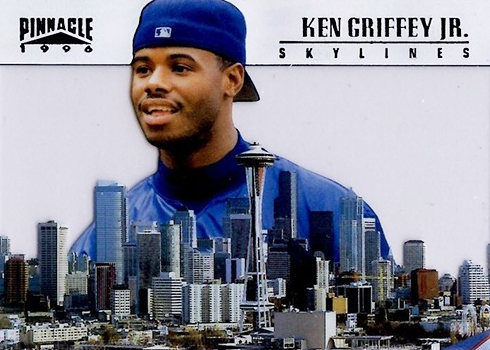 Also worth noting — Score calling Ken Griffey Jr. a future Hall of Famer after two seasons in the majors. 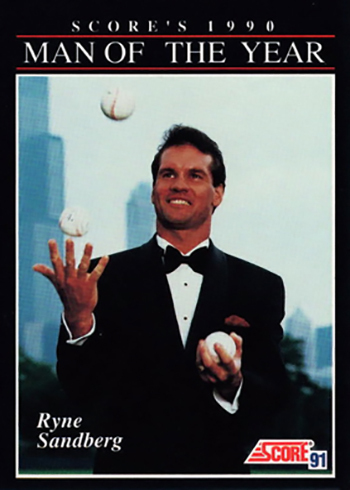 Your 1991 Stadium Club Nolan Ryan might have a tuxedo, but does it show anyone juggling? I didn’t think so. When you rip enough packs of 1991 Score Baseball, you start to notice things. Like offers for more cards. 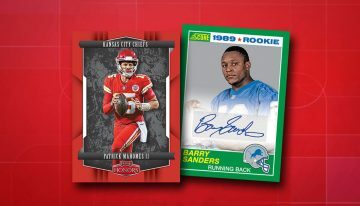 Like many (probably an understatement), I bit when it came to the special Rookies box set. For a few bucks, I got 40 “rookies” and a handful of those delightful lenticular World Series History cards that were in everything 1991 Score Baseball. Today, the checklist is more a reminder of who didn’t make it rather than who did. Remember Hensley Meulens? Jose Offerman? Tim Naehring? Tino Martinez, Ray Lankford and Mo Vaughn are about as good as it gets. But it was baseball cards in my mailbox before the days of the Internet and eBay. 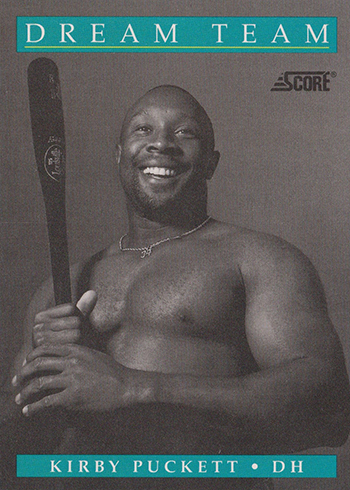 Okay, nobody really asked for a baseball card of Kirby Puckett without his shirt on, but the 1991 Score Dream Team subset is the third best use of the term ‘Dream Team.’ Only the 1992 USA basketball team and the pairing of Brutus ‘The Barber’ Beefcake and Greg ‘The Hammer’ Valentine are better. 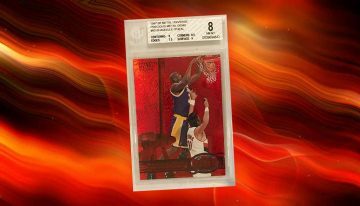 These cards are art, boasting memorable black and white images of the best players of 1990. You’ve got Doug Jones holding a baseball that’s on fire. There’s Roberto Alomar looking like he’s falling into the Sunken Place 26 years before Get Out hit the big screen. 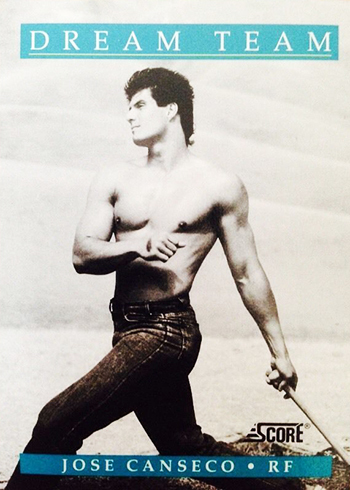 And then there’s Jose Canseco, posing like a modern day Adonis wearing tight jeans and no shirt, creating a very different effect from Puckett who looks more like a guy laughing it up in a community sauna. 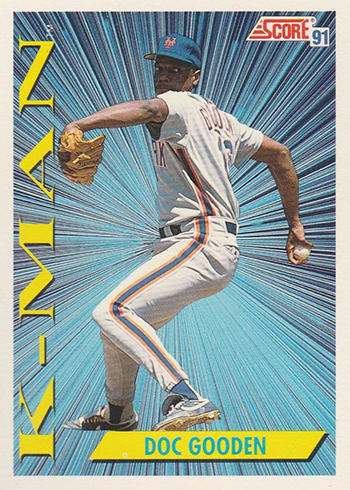 I’m not sure how it was in other areas, but it was that Canseco that marked a peak moment in the hobby where I grew up. I remember a table at the local shopping mall set up outside K-Mart with it. The price tag? $25. That was the card everyone wanted — at least until something better came along. It didn’t matter that it wasn’t an insert. Inserts weren’t really a thing in 1991 unless it was an Upper Deck autograph or Donruss Elite card. The 1991 Score Jose Canseco Dream Team was the glorious and artful bookend to Series 1. It was different from anything we’d ever seen on a baseball card up to that point. 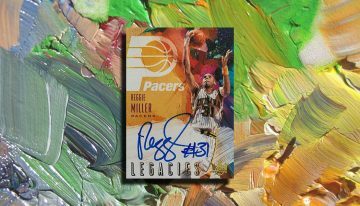 And today, it’s those memories of those crowds it drew in that makes it one of the most iconic cards from one of the biggest years sports cards has ever seen. 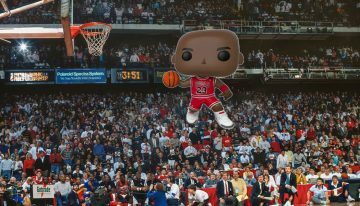 You totally captured the greatness of the 1991 Score set. A few years ago I bought an entire set for all the reasons you outline. 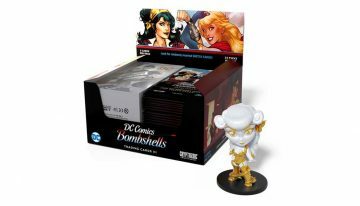 This set carries an immense of amount of wonderful entertaining subsets. 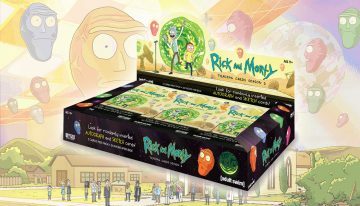 I actually bought a box of this in the last year. Another cool card is the Reds October where Barry Larkin is shown doing a backflip. 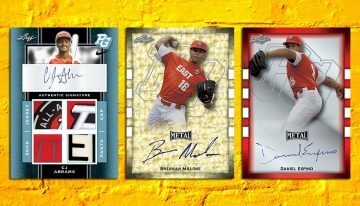 And I’m guessing the Mantle cards are as tough to pull as the Donruss Elite inserts from that year. 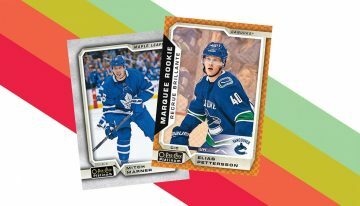 I grew up collecting hockey cards. This was the first baseball set that I fell in love with. 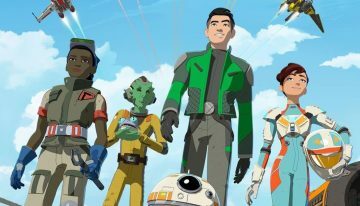 Score did such a fantastic job with the look and design. 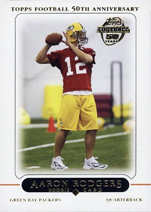 All the cool looking subset cards and rookies all looked different than any other set before. 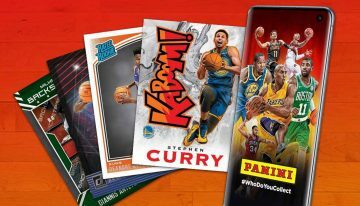 IMO it was a home run to collectors who love collecting cards and not concerned with the business part of cards. I spent hundreds trying to complete the set and maybe $50-75 on a binder and plastic sheets to put them in. Great article guys it brought back some cool memories. 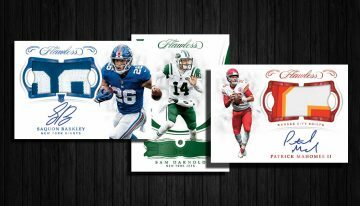 I think I will go haul out my binder and take a stroll down memory lane and go on the marketplace and get a few of the missing inserts lol. Thanks. There are A LOT of these sets out there. 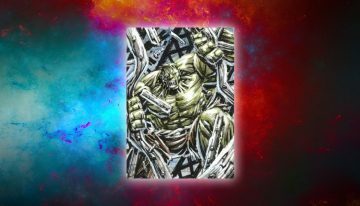 The greatest value might come from opening it up and just going through and enjoying the cards themselves. There’s lots of cool stuff in there, just not really worth that much in the monetary sense. I bought this set at a thrift store yesterday and have been having a great time going through it. I was mostly done with baseball cards by 1991, so everything in the set is new to me. Apart from what you listed, what really stood out were the purple and teal color scheme (doesn’t get more 90’s than that) and some of the questionable photo choices. Oddibe McDowell backing away from and inside pitch. Andy Van Slyke making an off-balance catch while running away from the camera. Chris Sabo getting tagged out at home by a pair of disembodied hands. And, my personal favorite, Dennis Eckersley delivering a pitch while an out-of-focus batter dominates the foreground. 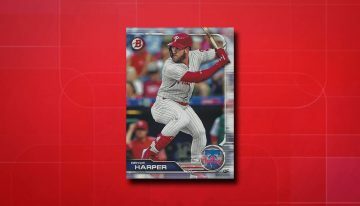 This set really seems to embody everything that was great and everything that was completely ridiculous about baseball cards in the 1990’s in one place.